Met with some excellent internship candidates for Art.sy at Yale University today, followed by a talk at Hack<Yale> on startup tech: organizing a project from a tech point of view, people, hiring, resumes and being a successful engineer. I really enjoy speaking in front of students: it’s a captive audience with the future in their own hands and few past mistakes. Young engineers aren’t ruined by the failures of entrenched organizations either, and everything new and exciting is very much ahead. Someone asked a good question today on whether I would recommend one work at a single company for 5 years? I did that twice, 5 years at Microsoft and 5 years at AppSec. To be honest, I don’t know. I think it’s all a matter of context. Looking back both were great experiences and read well on my resume. Most importantly you must be at a place that makes you happy and helps you grow. Maybe a good time to leave is not after 2, 5 or 10 years, but when you have reached your comfort zone? 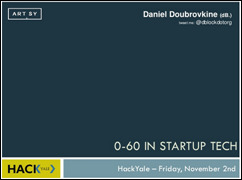 Hack 0-60 in Startup Tech was published on November 03, 2012 . See a typo?